Military medical universities are being encouraged and helped to shift from their previous focus of making profits to putting more emphasis on their important battlefield-oriented duties under sweeping reforms, Chinese military professors said on Monday. As part of China's ongoing military reforms, the Ministry of National Defense announced a new name list of military universities and colleges on June 29, 2017, with the three top universities being renamed based on their military services. In this list, the Second Military Medical University, Third Military Medical University and Fourth Military Medical University have been renamed the PLA Naval Medical University, Army Medical University and Air Force Military Medical University respectively. Chinese defense ministry spokesperson Wu Qian said in 2017 June, "This round of reforms of military academies has adjusted the structure and layout of the military education system." "After this, we will have formed the overall setup of academies with joint operational universities as the core, specialized colleges of various arms as the foundation and civil-military integrated education as the supplement." The reforms have cleared up widespread queries in society about the necessity of military medical universities, according to an article posted in the PLA Daily public WeChat account on Saturday. And training medical professionals through regular medical schools has led to criticisms of the special duties shouldered by the military academies, the article reads. "Don't forget, the most important part of the name 'military' medical universities is the word 'military,' and the 'combat' role should be prioritized," Zhou Xianzhi, who has served as the head of the PLA Air Force Military Medical University since 2017, was quoted in the article as saying. Such reforms demonstrate the Communist Party of China Central Military Commission's resolve in adjusting and reshaping the education and training system for military medical universities, pointing a clear direction for the universities to optimize their resources under the "battlefield comes first" principle, Zhou said. Naming medical universities according to their services can effectively control their numbers, avoiding a future increase in the number of schools that abuse the military title, Li Daguang, a military professor at the PLA Defense University, told the Global Times on Monday. Li said that such a move can provide clear outlines for military universities' daily research and training work by optimizing their resources and shifting the focus from the market back to the battlefield as their military nature demands. It is also in line with the overall spirit of military reform, Li added. Zhou also admitted that under certain circumstances, military education and medical institutes previously invested too much of their energy in expanding their scales and pursuing profits while neglecting their duties on the battlefield. "Now, with the new names and reformed structure, we are shifting the focus back to the battlefield and readiness for winning wars, which is and should be the major job for military medical universities." 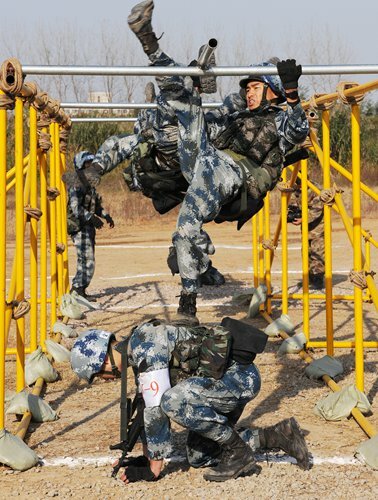 According to the PLA Daily article, the PLA Air Force Military Medical University, formerly known as the Fourth Military Medical University, is now under the management of the PLA Air Force establishment, and has trained more than 90,000 medical talents for the army and the country over the years. Historic breakthroughs have been made in military reforms, with four former general departments at PLA headquarters being reorganized into 15 agencies within the Central Military Commission (CMC). One-third of the personnel have also been cut, according to the Xinhua News Agency.